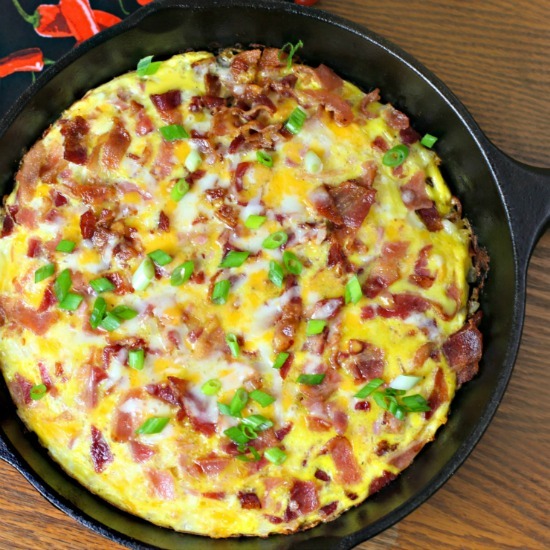 In a 10-inch skillet over medium heat, cook bacon until crisp. Using a slotted spoon, remove to a paper towel lined small bowl. Carefully remove half of the bacon fat using a spoon. Cut sausage into slices and brown in the same skillet on both sides. Remove to the same bowl. Add oil and butter to the same skillet, and then add onions and hash browns. Sprinkle the garlic powder, onion powder, salt and pepper over the top and stir together for 1 minute. Spread out the hash browns and let cook for 5 minutes without stirring. Turn the hash browns over and sprinkle the cheddar cheese evenly over the top. In a medium sized bowl, stir together the eggs, milk, garlic powder, salt and pepper. Pour egg mixture over the top of the cheese. Sprinkle the bacon and sausage pieces over the top. Place in the oven and bake for 10-15 minutes or until knife inserted in the center comes out clean, top is puffed and the cheese is melted. Remove from oven and top with green onions, if desired. 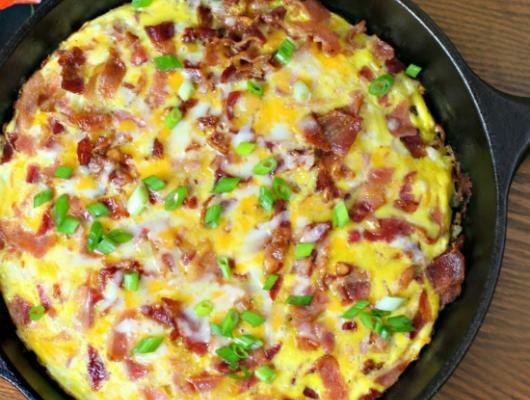 Cheesy Bacon Sausage Egg Hash Brown Skillet is a scrumptious, easy breakfast loaded with bacon, sausage, hash browns, cheese and eggs!